Tembo! was produced with Dramatic Adventure Theatre; teaching and communing with the Mloka community in Tanzania. Tembo! was devised with DAT-Action Tanzania; teaching and engaging with the Mloka community and traveling through Tanzania. TEMBO! Is an original folktale told through heightened physicality and flights of verse; a prayer-song against violence and extinction that explores what we lose in gaining. 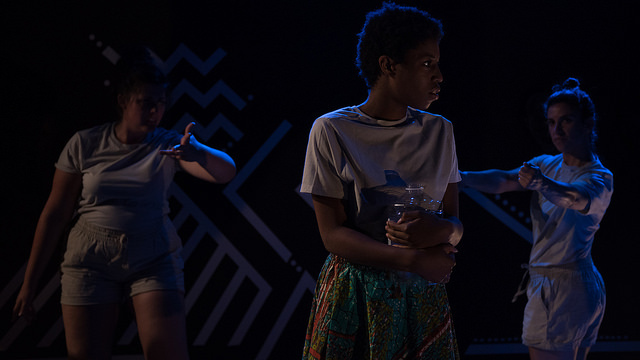 Set in the year 2022 in the village of Mloka, the play follows the journey of Habiba, who is determined to find a functioning water source for her family. When she discovers the nearby watering holes are untouched and barren, Habiba's spirit guides lead her to the blessing and curse that could change Mloka forever.